My second long jump attempt on 15/12/2018. My heat of the 100 metres on December 15, 2018. Non Shield Meet and Starting Strength Work. Yesterday was a non Shield meet, using the same Program 1 events as last week, so I entered the same events - 200m, 100m and discus. Conditions were warm with only a light headwind for most of the time, though the wind did get quite variable at times. First event was the 200 metres. Despite feeling as good as last week, the time was a slow 27.92. Not quite sure why. I finished quite strong, so fatigue doesn’t seem to be the issue. In the 100 metres, I had a good run, only 0.07 seconds slower than last week, despite not having the huge tailwind of last week. I was fairly happy with this result. My discus form was all over the place this week, but one throw was still reasonable at around 18.5 metres. Due to my dodgy proprioception, I need to constantly review my technique. In the past, video has proven to be a very useful tool to get feedback, both directly, as well as with the informed opinion of a coach watching the video. Hopefully I can organise some video recordings in the near future. Today, I started work on the strength/power deficiencies I identified last week. I’ve started a new gym routine to develop leg power, especially in the glutes, to help with both my ladder climbing and acceleration. With 5 weeks to the next fire brigade competition and 7 weeks to the country championships, there is time for this work to have some impact for the latter half of the season. Had a big sporting weekend the past couple of days, with an athletics meet on Saturday and the first fire brigade competition for the season on Sunday. Saturday was very warm, with a strong, gusty northerly wind, which was a tailwind for the sprints. I had entered 3 events - 200m, 100m and discus. First was the 200 metres. Got a good start and bend. Finished well with a time of 27.43, my best so far for the season. After an hour or more wait, it was time for the 100 metres. Despite the assistance of a 2.9 m/S wind, my time was only 13.50, which seemed a bit slow for the conditions. The discus followed immediately after the 100m. Was in good form, with a best throw of 18.87m. On Sunday, I arrived early at the fire brigade track, mainly to get a good parking spot. :). However, this time there was a combined senior/junior program, which meant a lot more waiting than normal. My first event was a couple of hours later. First up was the ladder race. Got through the heat with an 8.55 second run. Was a bit slower in the final with a time of 8.74. like the 100 metres on the previous day, this seemed a bit slow. My starts were good, but the climb felt sluggish. After a 4-5 hour wait for the marehalls, which I didn’t run in, then some junior events, it was time for the pumper 4s. Ran first branch and had a reasonable run. If I recall, we placed second. Next was the hose and ladder 8s. This year so far, I’m the only member of the team capable of running ladder positions, so that was my role in this event. The run went smoothly, with a good run down the track, arriving in perfect time, just as the ladder was raised. The climb was again sluggish, but the hydrant man managed to time the water perfectly, with it arriving just as I reached the top. We finished second with a time in the high 25s. Then it was back to the pumper and ladder event. Made it to the top in good time, but there was a delay with the water. Think we scored third place. With the pumpers out of the way, the rest of the day was a busy sequence of reel events. The next one was the hose and reel 8s. I ran second assist, helping bring the second hose back to the hydrant. We came second with a 36 second time. The sixes followed the 8s. As I was one of the 2 extras that made up the 8 in the previous event, I was now freed to catch the reel. This involves waiting on the track just past the target disc, and taking the reel off the last remaining pole as it comes through. Once I have it, it’s a case of controlling the speed to best benefit the overall run. I can’t recall the place we got in this event. The next event was the champion 4s. I didn’t run in this event, but the team did score second place. The last event was the Y8. We were the only team to run this event. The run went well until the last second, when I didn’t quite make it to the top ofvthe ladder before the water came. Had to wait for it to be turned off, before I could proceed to finish the run. Anyway, we finished 3rd overall for the day, which wasn’t bad for the limited (by recent bad weather) training that we’ve had. For me, the big take away was the lack of speed, especially the climbing of the ladder. I need to do some work on this. I’ve decided on a two pronged approach. First, some strength work in the gym to help with power, while working on technique. Next week it’s back to athletics. Our 4x100m final at the State Relay Championships. Video courtesy AthsVic TV. Video of our 4x400m relay. Courtesy AthsVic TV. Yesterday was the annual State Track Relay Championships in Melbourne, which I have attended for the past couple of years. In the lead up, I put my name down to run in the 4 x 100 and 4 x 400m teams. Being 50, I was now eligible to be in the M50+ teams. However, in the middle of last week, I was contacted by the centre manager, asking if I could run in the 4 x 1500m relay as well, due to someone else not being available. Arrived at the track in Box Hill (a suburb of Melbourne, for those unfamiliar), in plenty of time for the 4 x 1500m, which was the first event. Since returning from Western Australia a few weeks ago, I’ve been a bit run down, and also had a heavy cold, from which I had almost recovered. Running the longer events has been difficult, and my performances at the local meet last week were lacklustre. So in cool and showery conditions, I lined up at the start line as the first runner for the 4 x 1500m. Got away well and settled into a steady pace. Despite recent difficulties, I cruised through the first 1000 metres in just under 4 minutes, right on target. Not long after that point, I hit the wall and had to push really hard to complete the last lap. Finished my leg and handed over the baton 6:08 after I began, which was a good result, given recent performances. I was completely spent and had to spend the next several minutes sitting under a shelter near where I finished. Meanwhile, my teammates completed the relay, and we ended up 5th. While 1500 metres is really not my distance, I am glad to have had the experience of running this relay. My next event was around 5 hours later - the 4 x 400m relay. Now we were getting into territory where a medal win was possible. This time, I ran the second leg. I took the baton in third place, but quickly gained second place while accelerating to cruising speed. Knowing I had someone fairly close behind me, I kept the pressure on the whole way around, with a strong run around the track to the next baton change, where I handed the baton over in second place. Our final two runners were able to keep us in second place between them, resulting in a silver medal for the team. Later, we looked up the record books and discovered that we missed the Bendigo residential record (meaning the fastest time by a Bendigo based team running anywhere) by about 1 second. Finally it was time for the 4 x 100m relay, where I could really open up and have fun. We had a good team, and on paper, we were capable of breaking the residential record for this event. Most importantly, 2 of us were among the top sprinters over 50 in our region, with the others being capable all rounders. Again, I ran the second leg. This time, we were already in the lead when I took the baton, early in the changeover zone. Quickly accelerated to top speed, significantly extending our lead. After around 125 metres, I handed the baton to our third runner in a smooth change. The remainder of the team extended our lead further, with the 4th runner being the fastest of all 4 of us. We easily won by around 6 seconds, and in addition, we broke the Bendigo residential record by around 1.5 seconds. So, a very successful day at the state relays, and it looks like my performances are finally returning to normal. Yesterday was a long day and I didn’t get around to posting the update, but here it is, finally! The day was a busy one, with 5 individual events and 3 relays. First up was the 110m hurdles. In a way, this was part familiar and part strange. Familiar in that the distance was 110 metres, same as I had run last summer twice. However, the oddities were firstly that the distance spec was wrong for me - I should now only run 100 metres with the hurdles closer together (one of the perks of getting old!). The other odd thing is the height was only 76 cm instead of 91cm, because they were Little Athletics hurdles. Anyway, I started the race with my ugly but effective technique, but soon I found I could run a smooth 5 stride technique, and covered the rest of the race faster. Finished with silver with a time of 24.73. Next up was triple jump. Got into a tight competition with another guy, but couldn’t quite beat his best jump. Silver with a 7.47m jump. Towards the middle of the day came the event I wasn’t looking forward to, because it’s longer than my normal distances - the 800 metres. I made a last minute decision to enter it almost 3 weeks ago after studying past results and figuring that I actually had a chance in it. Anyway, the race got under way, and a number of guys raced off ahead and then cut into lane 1 hard when we were permitted to, after the first bend. I started more cautiously, and slowly eased myself into lane 1, because that was the shortest distance to the finish, and it gave me time to select a place in the pack. By the end of the first lap, I had passed a couple of runners, and took on a couple more over the next 200 metres. With 200m to go, I only had two in front of me, and I was feeling good. The heavy tactics of this race kept me mentally occupied, and I didn’t notice fatigue. At 150n to go, I could see the guy in front of me starting to slow down, so I increased speed a little more, to get close to him on the bend. As soon as we got into the home straight, I took a step to the side and went for the sprint finish, leaving him behind, and now I was starting to feel in the front runner. Finished the heat second in a time around 2:54, but as the other guy was in a younger age group, I got the gold in mine. Second place in my age group was around 34 seconds behind me. After the 800m, I had a bite to eat, then it was a long wait for discus. However, as we were about to start the discus, we were called to the 200m start, to run that event first. Ran the 200 into a stiff headwind on the bend, getting silver in a time of 29.43. Meanwhile, back to the discus, I wasn’t able to reproduce the form of last week, and was only able to throw 15 metres, instead of 19. That left the throws the only discipline that I didn’t win a medal in. The day finished with 3 relays. I teamed up with Police members from Western Australia and New South Wales to form a team. In the 4x100m relay, we came in third of the over 160 (total age) teams for bronze. I ran a strong third leg here. In the 4x200m, I again ran the third leg, which was the most technical, with the transition from set lanes to running in Lane 1. This time, we easily won the gold from a Northern Territory team. The final relay was the Swedish relay, which has legs of 100m, 200m, 300m, and 400m. They were run in a different order - 100, 300, 200, 400m. I suggested rearranging the team order, to put a faster short sprinter (who won the 100m) in the first leg, and have the guy who would have been there run the 400m leg, because that was a stronger distance for him. If the two of us left, the other guy was a longer distance runner, so he got the 300m leg, leaving me with 200 metres to run. This combination worked well, with the first two legs putting us in a good position. I ran a fairly fast 200m leg, before passing on to the last runner for his 400m. He ran a strong leg, and again, we got the gold. After the final medal presentations (with a bit of light hearted fun), my tally was 4 gold, 4 silver and 2 bronze, 10 medals from 14 events. All in all, a very successful meet. Today was day 1 of competition at the Games. I had 6 events that would take up the whole day, namely high jump, shot put, 400 metres, long jump, 100 metres and javelin. Arrived at the track at 8:30 to check in and get my race number. With the initial check in out of the way, i had time to settle down and watch the 5000 metre events, which started at 9. After a quick warmup, it was time for the high jump. As a precaution, I opted to wear my normal runners, rather than spikes to lessen the impact on my injured foot. I hoped that, combined with the softer grass surface would avoid aggravating my foot. As it turned out, this did work well. Anyway, I elected to start jumping at 1.20 metres, which is my highest “safe” height. As expected, I cleared it first jump, same for 1.25m. at 1.30m, I missed clearing the bar by a mm or two, and narrowly missed equalling my PB. Still, this was enough for bronze. Next was supposed to be shot put, but this was running behind time, and I ended up running the 400m first. After getting some blocks organised (I was the only one who chose to use them), I was ready. Started well, then settled back into cruising pace. By this time, I had already made up the stagger on half of my competition. In the back straight, the headwind forced me to make a minor speed adjustment, so I could go harder in the final bend and home straight. Finished first in a time of 1:06.80, 17.3 seconds in front of second place! With the tough windy conditions, I was happy with that time. Back to the shot put, I threw 5.95 on the first throw and a bit shorter on my second, with a no throw third. This was a fair bit short of recent throws with the 6kg shot. In the 100m, we had a full field of 8. Again, I was the only one to use blocks. But this time, had a bad start, but still ran a season best time of 13.34, narrowly missing out on bronze. Final event for the day was javelin, where I threw a season best 17.65. not yet sure of placings. So far, a successful trip. Day 2 is set to be a busy one as well. I’m sitting on the Eastern Foreshore at Mandurah, where the opening ceremony for the 2018 Australasian Police and Emergency Services Games will be held in around 8 hours time. Countless hours of training, along with support from the Eaglehawk Fire Brigade got me to the point of traveling. One of the Brigade members picked me up at 7 AM and dropped me off at Melbourne Airport. From there, it was up to me. Checked in my bags, printed a boarding pass and went through security, then settled down for a snack and a blog post while waiting to board. The flight was uneventful, and we landed in Perth just before noon. Now the fun started with inadequate information. First, the wrong flight number was on the baggage carousel, but a process of elimination and observing the first few bags confirmed I was in the right place. I retrieved my bags then went looking for the bus. Then things went a little pear shaped. The signs at the airport were unclear about where the regular city bus stop was, they only referred to the courtesy bus that ran between terminals. Google Maps were no help, directing me to walk 2km for what was a 150m walk! And the official app offers by walking maps or directions other than to go to X street. Luckily, a helpful taxi driver pointed me in the right direction, and I made the bus. The next hitch was that I missed the next connection. My bus was a minute late and the connection was a minute early. Through a process of searching, studying maps and sheer wits, I found my way via another bus to a train station on the Mandurah line. From here, the rest of the trip proceeded smoothly. The day’s events reminded me of the struggles many other autistics face when things don’t go to plan. But I am able to remind myself of my strengths and have confidence in my ability to overcome challenges. In this case, I knew my key assets were my excellent navigation ability and logical mind, with the ability to walk long distances the last ditch backup (I didn’t have to use that!). Anyway, I arrived and checked into the motel, did a little looking around and caught up with a friend. Next little hiccup was the main supermarket closing at 6 PM. This is something that never happens back home, so I got a lift to the smaller supermarket that was open. So that ends the travel and settling in. In the next couple of hours, I will check in, so I get my security pass and participant package, then head over to the track to suss out the venue and test spikes on the grass, before taking part in the opening ceremony at 6 PM. I. The meantime, enjoy a few pre - Games photos. This week was round 3 of AV Shield. It was also my last local meet, before traveling to Western Australia for the Australasian Police and Emergency Services Games. I had entered 8 events for this week, namely 100 metres, 200 metres, 800 metres, high jump and discus. First up was the 200 metres. Conditions were tough with a very strong headwind from a front which has passed through a few hours earlier. With my major meet now just over a week away, I erred on the side of caution, taking the early part of the race easy. Once I started facing the wind towards the end of the bend, I pushed hard and found was able to gain a lot of ground into the wind. Unfortunately, I wasn’t able to maintain that amount of power into the wind for the entire length of the straight, and finished a close second in my heat in 28.19. Next up was the high jump. I chose a starting height of 1.20m, thich took 2 attempts to clear. My next height was 1.25m, which I cleared on the first attempt. Wasn’t able to get my run up right for 1.30m, and missed that height. Back to the track for the 100 metres. Unfortunately, the high jump stressed my heel a bit, and the cool conditions required caution again. Ran a time of 14.13, with most of the race run well below my capabilities. My final event was the discus. As the start time was the same as the 100 metres, I didn’t get a chance to do any warmup throws, which lead to the jokes about not wasting my good throws on warmups. And there seemed to be a bit of truth in that joke, as my first throw was a PB of 19.22. Second throw was a bit wobbly and short, and the last throw was 19.02, even though I didn’t follow through properly, which probably cost me a metre or more. Overall, it wasn’t a bad day in tough conditions. Stay tuned over the next week or two as I travel to Mandurah for the Games. 2018 Australasian Police and Emergency Services Games! On October 27, I will be departing for Mandurah, Western Australia to compete in the Australasian Police and Emergency Services Games. 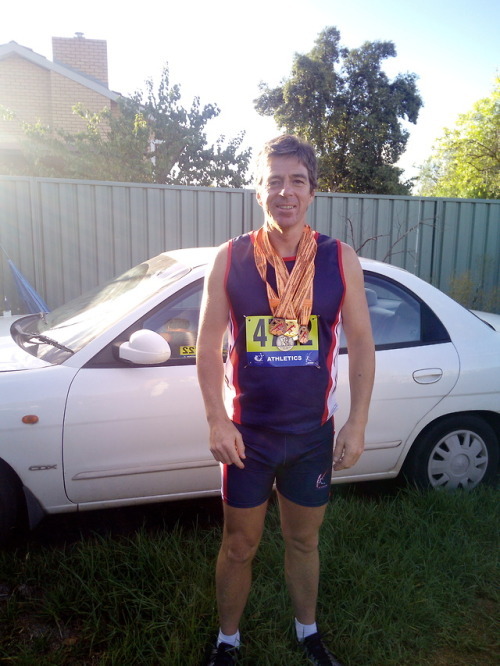 For the past 3 years, I have competed at the Victorian Police and Emergency Services Games, winning mostly gold medals in the 100, 200 and 400 metre sprints. I am also competing in the 3 relays, which will require combining forces with other competitors to form a team: 4 x 100m Relay, 4 x 200m Relay, Swedish Relay. Overall, I believe have a good chance of winning several of those events and am looking forward to the opportunity of representing Victoria, the CFA , my local community of Eaglehawk and my Fire Brigade. It’s hard to believe another winter has gone by. My cross country season was cut short by injury in July, and by the time I was back running in late August, it was over. This past few months have been spent trying to get myself back up to top form, in both speed and fitness, so I can be competitive in the months ahead. With major meets dotted throughout a 6 month period, this is going to be a more difficult year than most to be in top for these competitions. In the past couple of weeks, I’ve also started pre-season training with the fire brigade competition team, to prepare for another season of competition. In the last month, I have been able to train at full intensity for the most part, though in a pre-season meet 2 weeks ago, I only managed 14.04 for the 100 metres, admittedly with a strong headwind. 4 days later, I mildly tweaked my left hamstring while attempting starts on the bend, probably the riskiest activity since injuring my heel. However, it was a very minor issue, and within a couple of days, ther seemed to be no sign of it. Still, with some major competitions in a few weeks, I decided to err on the side of caution for yesterday’s first round and choose an unusual (for me) combination of throws and the 800 metres. I chose the 800 metres for two reasons. Firstly, the power requirements are far below anything likely to cause injury. In fact, I have raced 800m at full race pace in the past mere days after previous hamstring injuries. Secondly, the 800m is a good test of fitness, which would have taken a hit in July-August. The first half of the race went to plan with a 1:16 first lap, which was right on my target pace. By this time, I had caught up with another runner who had surged ahead early. I felt I could have passed him, but decided on the tactical option of sitting just behind him, knowing that in the event of a sprint finish, I would have the upper hand. Had I gone earlier, there was a risk he might surge too far ahead. Anyway, I stayed behind him until the start of the home straight, where I made my move with a rapid change of pace. Finished the race in 2:39.66, which I was happy with, given my general fitness and tactical decisions. My final event was the discus. Early in the winter, I was throwing over 20 metres at training, but I had to also put my throws on hold after the injury. Had 3 good throws, the best of which was 18.57 metres, which is a new PB, and well short of my known capabilities. I’m hoping for a good season of discus this year. While the track was finished, it turned out the sporting day wasn’t over. In the evening, the fire brigade held its annual presentation dinner. At the dinner, I was presented with the “Runner of the Year” award for the fire brigade running team, which was a high honour. This was the icing on the cake which capped off a good day overall. Hopefully next week, I’ll be back among the sprints.